Once every while you use a product until there is no product left. This is a post about those products, it’s a products empties. I will let you know what products I have used up, and what my thoughts were and if I would buy them again. The first product is the Wella Pro series Moisture treatment. This is a conditioner/masque for your hair. I really liked it. It gave my hair shine, it moisturized, it detangled my hair. It was like the perfect product. I would definitely buy it again, the only downside is, that it is no longer available in Belgium. So I bought me some products from Macadamia. Another hair product that I finished is the Schwarzkopf Bonacure hairtherapy in Color Freeze. I liked this product, but I didn’t love it. I find it very hard to find a good shampoo and I’m not quickly satisfied with it. This one in particular is for colored hair. I don’t have full colored hair, but i have some highlights that I want to nurish as much as possible, that’s why I went for a color-treatment shampoo. It does help to keep you color for a long time, but beside that, it doesn’t do much else. I do recommend to use a good conditioner with it. I would recommend it if you want a good shampoo for colored hair. The next product is the Rituals Yogi Flow shower gel. I love this product, it has a nice texture, it smells great and it gives a spa-like feelingx. Rituals has more of these products with different scents. I did buy it again already, I bought the Yogi Flow twice again, and now I wanted to try another scent, so i got the Sunrise one which is with a orange and ceder wood scent. Another emptie is my Gucci by Gucci perfume. This one is the eau de parfum. I prefer eau de parfum because the scent is stronger and it stays on longer. This is a really nice scent and I would definitely buy it again sometime, but I want to try another scent first. I am looking to buy the new one from Armani, Sí. The next product is a make-up product an it is the Dior Diorshow Iconic mascara. This is a great mascara! It kind of does everything you want from a mascara. It lengthens, gives volume, it separates the lashes. I really like to use this product. I know it’s more on the expensive side (around 30€ or 30$) but I think it is worth it, somethimes you have to splurge on your make-up if you can. I already got myself a new one that is waiting to be used. The last product is a nail polish remover (kruidvat). I didn’t really used it up, because I didn’t really like it. I used it a few times to see if it was my nail polish that was hard to remove (because of glitter or a darker color) but that was not the case. Even my lighter colors were very hard to remove with this. I already had tried another one from Bourjois, and I liked that one way better. I wouldn’t recommend it if you are looking for a quick nail polish remover. There are other ones that work better. What are the products that you used up and would recommend to people? 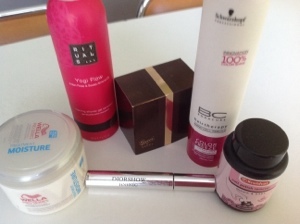 This entry was posted in beauty and tagged Dior, Gucci, hair products, kruidvat, mascara, nail polish remover, perfume, Product empties, rituals, schwarzkopf, shower gel, wella by missnathaliexo. Bookmark the permalink.